ContestNinjaElite! - ContestNinjaElite Review, Reviews & Info to Win more prizes, win contests, win sweepstakes, win cash, easier and win by increasing your chances! "Do you spend hours entering contests, only to maybe get entered in 30 or 40, and feel exhausted afterwards? What if you could enter 250, 350 or even 1000 contests in that same time frame, and spend your precious time focusing only on contests that require a lot of extra entry information? "Can it happen? Yes. Does this software work? Yes, of course!" Before we get to the good stuff... a few things... This software is so good and effective, that over the years a few very specific people have done what they can to try and prevent other people from using it, to scare them, to frighten them, through negative posts, negative reviews, and make false claims themselves... And they are very talented at spreading disinformation. You may be nervous about using any software form filling program assistance, because you don't know what is accurate at what isn't. This will set the record straight. This short article has been written address any concerns you may have BEFORE we get to the good stuff (click here if you want to get to the good stuff right away). 1. The Rules Say (some variation of) I can't use 'automatic' form fillers, scripts, macros or bots - Yes, that is correct - most sites do not want you manipulate entries and use "bots" or "macros" "automatically". What is important - is understanding "what" is usually defined as "automatic", a "script", a "macro" or a "bot". Understanding what is generally acceptable. This is where people get scared or angry of potentially getting disqualified. Most contest sponsor sites actually want you to know what you are entering. They want you to enter according to the frequencies set (i.e., if daily, then once per day, etc). They want you to see their name associated with the contest. If you do all of that, then usually it is acceptable to use a form filling program to help speed up the entry process. What they don't like is if you have someone enter for you (because then you never see the company name) - i.e., automatically entered for you by someone else. Or - if you try and abuse the entry process (i.e., entering 1000x for a 'single' entry contest - which some people use scripts for). So if you try and abuse the entry process - i.e., never see the advertisements, try and 'ballot stuff' (i.e., 1000 entries for a single entry contest), use 1000's of different e-mail address for the same person, then they don't like that. And yes, in those cases, you will very most likely get disqualified. Roboform - an extremely popular 'general purpose' form filler since about 1998 - has been the subject of great concern amongst many people who enter contests. Will they get disqualified. Is it acceptable. Etc, etc. simply google something like 'roboform sweepstakes entry' or 'roboform contest entry' and you'll get lots of posts discussing this. If you read through all of that - basically what you'll get out of it is this. Many people use Roboform, and many people win prizes when using it. Other people are scared of using it, so don't, and instead spend many more hours typing things out, and they win prizes too. Many people don't win prizes. But ultimately - if you keep reading - you'll find most successful winners use some kind of form filler to speed up the entry process, because it is a numbers game. The more you enter, the more likely you are to win. And most articles, whether on blogs, contest or sweepstakes forums will agree that as long as you know what you are entering, help promote the contest/sweepstakes yourself (through forums, etc), see the advertising - then speeding up the entry process through form filling is acceptable. This software is simply a specialized form filler specifically designed for people wanting to enter contests or sweepstakes. It does a lot of the heavy lifting for you - finding the sweepstakes, speeding up the form filling and so forth. But you still enter from your own computer, you still see what you are entering, and you still see the advertisements. And - the software prevents you from accidentally entering too often. So based on all the forum posts, and discussions, this would generally be considered acceptable. But ultimately, it is up to you what you are comfortable with. So you decide. Do you want spend 10 hours a day entering 50 contests? Or - would you like to enter 300 contests in a hour - and spend the rest of your time focusing on hard to enter contests/sweepstakes? It's up to you. 2. Will I just get entered into a bunch of "crappy" prizes like books and cds and stuff that no one wants, and just get spam? First of all, many people never win a single thing in their life. Second, while some sponsors may offer books and CDs (which incidentally many do not consider 'crappy' prizes), there are usually many more prizes like electronics, vacation packages, VIP tickets, cash gift cards, and so forth. Usually the smaller prizes are given out with a chance to WIN a big prize, so people are happy because the small wins keep them going while they aim for the big win. Almost every single large contest or sweepstakes will have 'secondary' prizes. They can't give away 1000 cars (unless they are Oprah - which, incidentally she only did once), or 1000 vacations. So many times they will have lots of secondary prizes. Not just "books" or "cds" (a scare tactic used by one specific individual). But they might have swag - like t-shirts, gift bags - $100, $250, $500 gift cards, etc - in addition to the big prize, like a $10,000 cash prize or $25,000 vehicle. AND - people love winning this stuff - because it is FUN - and ALSO because the "BIG" win could just be around the corner. Finally - will you get "spam"? Well - if you enter a contest or sweepstakes - usually for a chance to win - you are giving the sponsor permission to e-mail you. So actually - that is not spam. YOU are giving permission for them to contact you. Many times there may be 100's or 1000's of entries for a single contest - and of course, only one winner. And of course - companies offer contest or sweepstakes because they hope to make more money from sales than the cost of the prize. If they don't - then they can't give away free stuff, or give you a chance to win. So that is a small price to pay - a newsletter in exchange to win something big. That being said - if you plan on entering 100's of different contests or sweepstakes on a regular basis, then chances are you WILL get 100's of e-mail newsletters filling up your inbox. So - it is recommended that you set up an e-mail address specifically for entering contests or sweepstakes. BUT - make sure you still read it. Because - many contests or sweepstakes will require you to fill out an affidavit (i.e., like "CONGRATULATIONS! You've Won! Please confirm your address to send the prize..."), or confirm that you are a winner. If you don't confirm that - then they most likely will give the prize to someone else. (We've seen that happen MANY many times). So - still make sure you read your contest/sweepstakes entry e-mails. But to make it easier to sort - maybe make an e-mail address dedicated to entries. Also - the software does have different levels of what types of sweepstakes are included. Some require specialized processing, some require a lot of additional work on our end. (Many times higher end prizes like big cash prizes or vacations do use things like captchas which require a lot of additional work on our end). So - those contests/sweepstakes are divided into different categories of what you are looking for. 3. Do I have to pay taxes on my winnings? Depends where you live. If in Canada, no. But if you live in the US, and you win over $600 in a single year - regardless of whether you enter by hand, use a form filler, or any other means - they request you that you fill a form to pay taxes. ('Technically' it is any winnings, but they've set the threshold at $600). Important note! You would still have to pay taxes whether or not you used a form filler or not. (This is a popular scare tactic used by some individuals). But COOL/interesting note: (confirm this with your accountant, as this is just a suggestion, not advice) - in many cases if it is over $600, you can use the cost of any tools/newsletters/etc to help you offset the winnings. So many times (again, confirm for your specific situation) if you purchase a newsletter, a form filler to help you, etc - and then have a big win - you can offset any taxes you may have to pay with the cost of the tools that you used to obtain that win. Secondly - many sponsors recognize the potential 'financial' burden someone may have to pay if they won a big prize, so many times they will include a "cash" portion of the prize that can be applied to paying taxes. So for example - if it was a $30,000 car you could win - they might make the TOTAL prize package $40,000 (a $30,000 car PLUS $10,000 cash to help offset any potential taxes). So, the $10,000 cash could be applied to pay taxes, and essentially it would be like getting the car free & clear. If you are concerned about that - read the fine print when you go to enter. So... now onto the good stuff! What if you could fill in hundreds of contest forms in minutes, not days, and instead of repeating boring, repetitive tasks typing in the same information to try and win contests, you could actually focus your valuable time on more interesting things, like finding new prizes to win, or actually enjoying the prizes you do win?? Introducing the Contest Ninja Elite! - The ONLY contest software that allows you to easily and effortlessly enter, track and submit contests for multiple profiles! This tool was designed to make it as easy as possible for you to take control of your contesting efforts, and win much, much, more, while saving that one precious and valuable resource you have, which is time. The software works similar to Roboform (with or without Roboform Companion), which is how a lot of serious contestors currently submit contests. 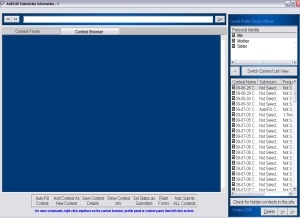 Some contestors manually type in everything, but most tend to use RoboForm for "automatically filling" in form information/repetitive information, which this software does, except this software is available for free. The software is not "automatic" in the sense that it would 'hammer' a website so to speak (in which case, of course it would be a DQ). Some contestors want to do that, but the software has safeguards to prevent that. (b) If you choose to enter every contest quickly, it allows you to simulate human entries (i.e., so you don't say enter 1000 contests in 1 minute, but can make it take 3-4 hours if you wish). So basically, you can have the software randomly wait a certain amount of time before clicking the 'submit' button, so it looks more 'natural'. (c) You get to 'choose' while profiles are submitted to which contests. Some contests only want you to enter a maximum of one person per household, while others may allow you to enter your entire family, even including your grandmother. You can choose which family members or friends can enter which contests on a contest by contest basis. Entries are unique, from your computer, thus preventing DQ's The problem with some other 'automated' solutions is that they either submit your name from exactly the same IP address (which is basically like a postal code for computers), or add some kind of 'tag' or 'marker' to any kind of submissions (i.e., in website server logs it would say 'This was submitted by XYZ company!'). These kinds of entries are exceptionally easy to track and DQ (disqualify). Basically, the software faciliates entering the 'repetitive' information, such as first name, last name, address, etc (so they don't need to manually type that in say 1000 times, if they entered 1000 contests). Basically very similiar to Roboform, except you can also categorize the contests, use the winning tracker to keep track of winnings, make sure you don't enter too often, etc, etc. 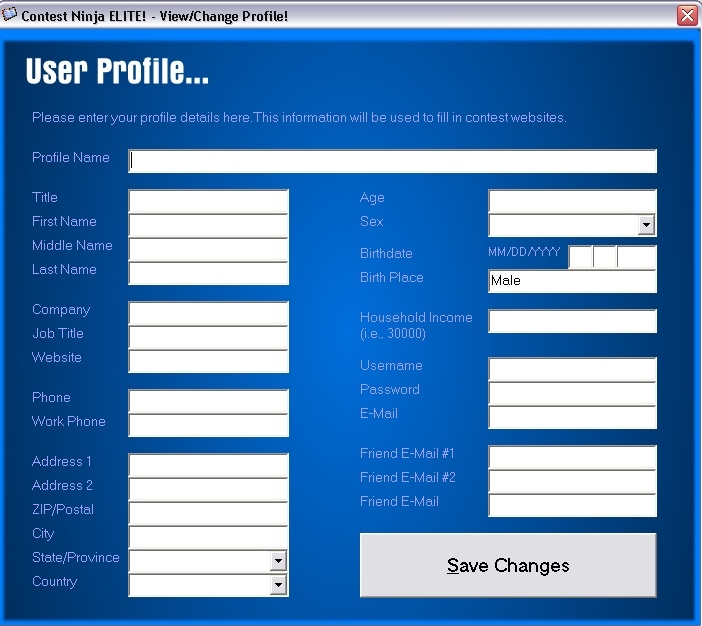 Create a profile once, and speed up entering contests through fast form filling. The software also protects against and helps prevent any DQ's (disqualifications) from happening as mentioned above, in that it allows you to decide which contests should be entered when, how often they should be entered, and which contests should be entered quickly or manually. If you wanted, you could enter thousands of contests with only the click of a button, and the software, with it's fast form filling, helps maximize your chances with the number of prizes you can win. Manual or 100% Fast Submission with Built-In [DQ] Protection! Many contests are able to be filled 100% quickly. This is great for daily contests, monthly contests, and so forth! You do still need to visit the sponsor website/webpage every time you enter a contest, but this software makes it much easier for you in that it will fill out information for you, so you don't have to spend countless hours on repetitive tasks. Instead of wasting your time on boring tasks, you can focus on having fun, which is the whole point of contesting! Plus, instead focus on what the sponsor has to offer you, while at the same time increasing your chances of winning a contest, and feeling good about it! 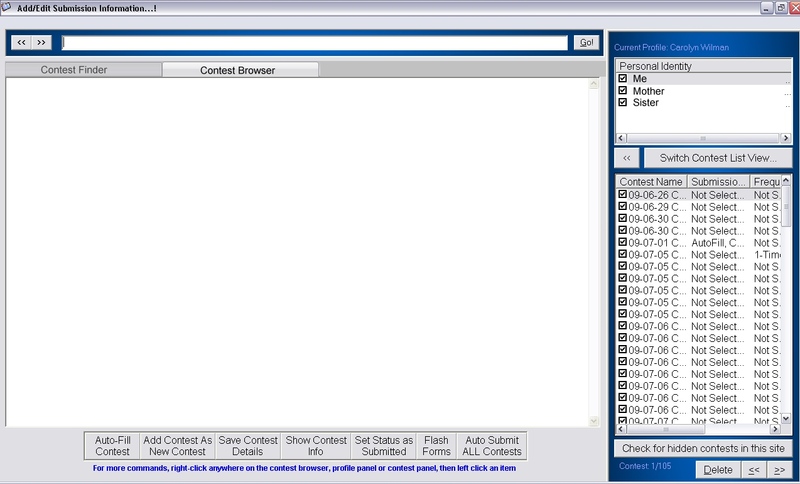 Ability to fill in Flash Forms!! Easily import contests from other software! If you are entering contests the old way, or a slow way such as through browser bookmarks, or using RoboForm, this software allows you to easily import those contests with a click of the button! Afterwards, you can get started immediately on entering contests! Imagine this. You have one of two possible lives. One without the software. And one with the software. 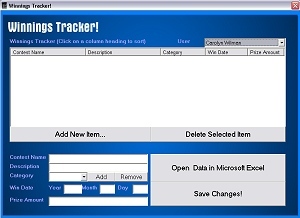 Example - You enter contests, without this software. You wake up at 5:30 a.m., no software to help you find, organize, or track your contests. You just start surfing the internet. You find a couple contests, but a bunch of popup windows appear that you have to close. You start typing in your name and address, only to realize that your browser freezes, crashes, and automatically closes. So you open up your browser to try and find out where you were, a little bit frustrated. Now... Imagine your life... WITH this software. You wake up, 7:30 a.m. Brush your teeth, turn on the computer. You want to enter some contests, so you start up some software, click a button, and 10 new contests that you can enter are quickly downloaded. You click another button, and then, this software starts submitting your name, your address to 100 contest websites. Total time so far. 3 minutes. Before you eat breakfast, you then decide to check your e-mail, and to your amazement, your eyes get wide and your mouth drops because you find you've won a $50 gift certificate to a favourite restaurant of yours, plus another $100 for a grocery shopping spree. You wake up your significant other to tell him or her the good news, and they kind of laugh, with a smile saying, "Another prize, huh? Wow... you certainly are lucky!". You smile to yourself, knowing that you deserve this, and wonder whether you really should go to work or not today. You think that is just so cool. You smile again. Total time so far, 5 minutes. You decide, yes, what the heck, of course you should go to work. Otherwise who else can you tell about your prize winnings? Just think.. what Sally will say when she finds out you've won, again, and what Bill will think of your winning streak... And then the high fives and pats on the back you'll get from everyone else. Everyone smiling, saying how lucky you are. And of course the odd person who is a little more friendly, because he or she wants you to spend a little bit of your winnings on them :) And should you? Well, yeah, maybe... And you smile. Only the top 1% of contestors who win consistently and win a lot of prizes, know that its not just how much time you spend entering contests, but rather, it is how many contests you enter in the time that you have. Contesting is a numbers game. The more contests you enter, the better your chances of winning. And wouldn't you much rather be spending your time enjoying your prizes that you win, rather than sitting in front of a computer all day, typing, hoping that you might win something more? 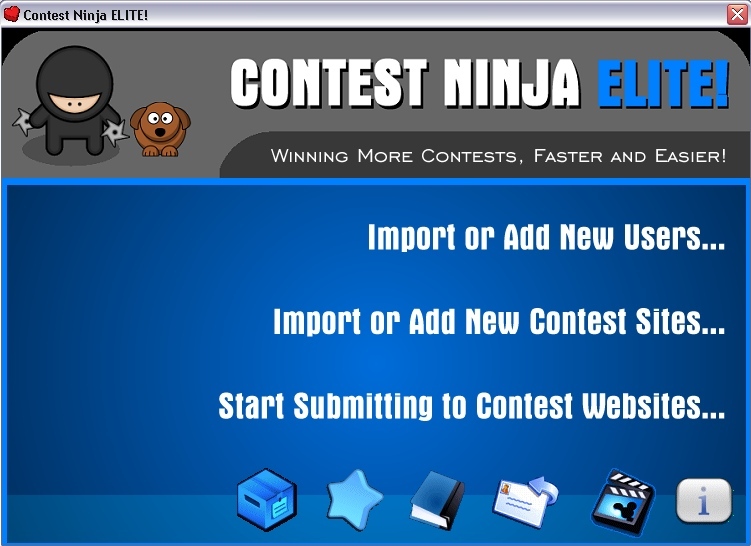 Introducing the Contest Ninja Elite! The newest, and easiest way of entering contests online! Have forms filled the very first time you visit them, while at the same time the software protects you against DQ's (disqualifications), teach the software how to fill in flash forms with a couple clicks of the mouse and have flash forms filled in, manage your winnings, plus much more! Don't just take my word for it. Listen to what other people have to say about the Contest Ninja Elite, right after getting the software! "So what does Contest Ninja Elite for you?" You do not need to manually type in information, which can be time consuming and tedious like some other software programs. Instead, the software intelligently guesses what should be filled in where. If it makes a mistake, or cannot fill in a particular field, correcting it is as simple as a click of the button. Simply right click on a field, select what type of information should be there (such as a First Name, Last Name, Address field, etc) -- and the software will fill it in. Once you have loaded in a contest, and have all the fields correctly filled out -- to fill it in with new information is exceptionally easy! Literally all you have to do is simply click on a different profile name (such as your mother, father, brother, sister or friend) -- and the software fills in the other contest details for you. No other software does this! Enjoy your morning coffee and no longer worry when Filling in Flash Contest Forms! With this software, you can easily fill in flash based contests. So no longer do you have to get sore fingers typing the same information over and over. Simply tell the software how it should fill in a flash form the first time, and when you visit it again, it can fill in the details with the press of a button. 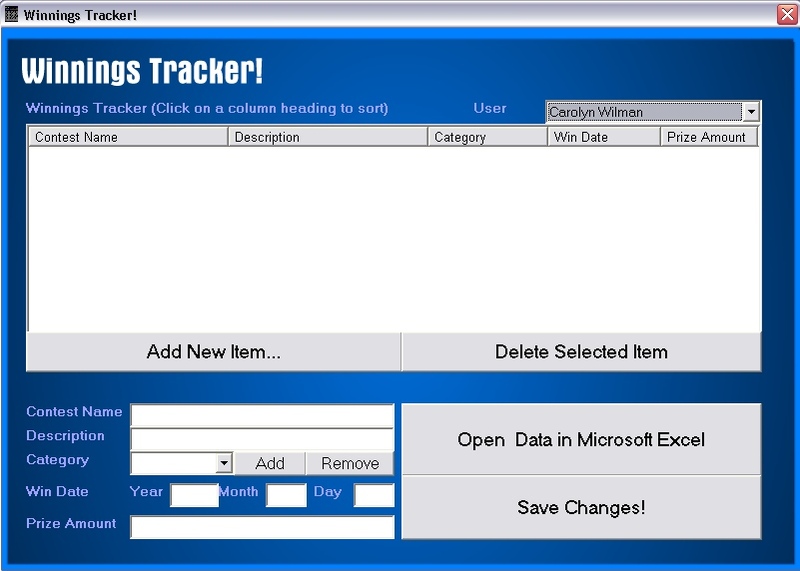 Organize your prizes with the Winnings Tracker! Easily see how much you've won with the winnings tracker, and follow up with companies that still need to send you your prizes! All you need to do is add the prize information to a particular user, and then you will be able to easily view that with the click of a button! Try out the software for yourself and see all the cool features, plus how much easier it is entering contests with this software! And... best of all... If you have an idea and would like to see it become a reality, send an e-mail using the feedback form! 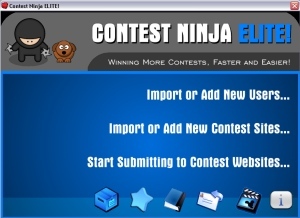 Enter your name and e-mail address below to get FULL ACCESS to the Contest Ninja Elite Software right now! Why not sign up for the FREE ContestNinjaElite! Newsletter and download the software at the same time? Basically, the goal of the newsletter will be to keep you up to date on great new contests, any exclusive specials/deals offered to contestors only, plus much more! You can also provide suggestions on what you want to see included, plus if at any time you no longer want to receive the newsletter, simply click on the 'unsubscribe' button!